Stephen Brown produces restful contemporary paintings with real interest. Light and atmosphere are always a compelling combination in Stephen Brown paintings. In ''Sunrise Salcombe'' we are witnessing the start of another beautiful day in the lovely British coastal town. 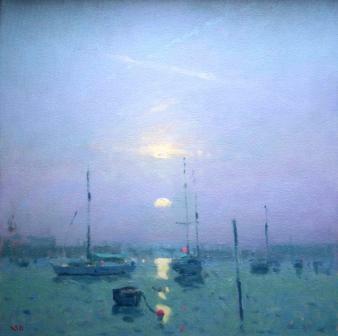 Stephen''s treatment of light and reflections creates a peaceful setting.